My daughter received this book for her third birthday and we are in love! What a great book! A young girl proclaims, “I used to only play princess until Mommy showed me pictures and told me stories of real, great women. Now dressing up is an adventure when, every day of the week, I am a daring new dame!” She has a different woman to emulate each day of the week. When she’s Amelia Earhart, she flies through the sky in her homemade, cardboard airplane. When she’s Ella Fitzgerald, she stands at the top of the stairs and sings to her audience of dolls. When she’s Marie Curie, she pulls out her science kit and experiments away. The little girl declares that dress-up is much more fun when you are pretending to be someone real who has done something great. She hopes that one day she will do something amazing and little girls will dress up like her when they play. The book is fun and the pictures are well drawn. At the end of the book there is a short biography of each of the women included in the story, and I think this is my daughter’s favorite part. We’ve made a conscious decision not to expose our daughter to the princess phenomenon. We don’t read the books or watch the movies or own any toys or clothes branded with princess designs. 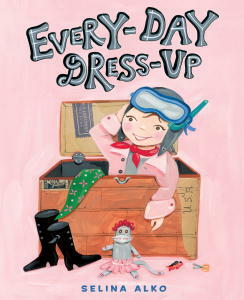 Like this book says, we think there are much better role models out there for our girl to aspire to be. Princesses are helpless, weak, passive, and wait for men to rescue them. Princesses are pretty, and that’s it, a message that teaches toddler girls that pretty is the number one goal to aspire to. But our daughter does know who the Disney princesses are. It’s hard to shelter her from the princess branding. She wore princess pull-ups, her dentist gave her a princess toothbrush, her grandparents gave her a princess swim suit, and her best friend at school loves princesses. Our current society pushes this princess branding onto girls and we can’t avoid it. An excellent book about this topic is Cinderella Ate My Daughter by Peggy Orenstein, which I would recommend to anyone raising a girl today. The women in this book (Amazon affiliate link) are not like princesses. They are smart, strong, and active. And like the book says, isn’t it more fun to play active characters than say, Sleeping Beauty, who sleeps through her entire story? One of the women emulated in the book is Julia Child. The little girl in the book is pretending to host a cooking show with a cardboard fish to cook. Last night my daughter said, “I don’t likethis page because she is going to eat that fish.” Even though it’s a not a real fish and my daughter knows the girl in the book is just pretending, it’s not a game she likes to play. I think that this book will spark some great discussions with my daughter as she gets older. Can we still look up to Julia Child even though she mostly cooked meat on her cooking show? We will definitely be enjoying this book in our family for a long time, and I’m excited about the conversations it will spark. Sounds like a book to check out! It is a difficult world to navigate, whether you’re a parent of a boy or a girl. I know with my daughter we didn’t do licensed character stuff early on but with gifts and the like they crept in. Have you read “Do Princesses Wear Hiking Boots?” It is a really cute one. The thing that shocked me in Cinderella Ate My Daughter were the stats about self esteem but I think that since the princess stuff does creep in we can counter it with other messages about empowerment. It is such a balancing act. We have tried (and succeeded for the most part) to use the word ‘beautiful’ when referring to our daughter – ‘pretty’ feels so one-dimensional. We have also made an effort to keep overly gender-biased toys/books/ideas from the equation. Moderation is key…but it can sometimes be elusive. I can’t wait to get this book for our library – great message – and the illustrations look so charming. Definitely a lot of food for thought with this topic…and one I see continuing through the years. I remember choosing gender-neutral nursery decor and baby clothes, even though we knew kiddo was a girl, and we have always avoided branded/character products — but Jennifer and Homa, you’re absolutely right, with gifts, the princess theme sneaks in! And Darice, now that kiddo is 6, I know what you’re talking about when you say that moderation can be elusive. Given a choice, kiddo almost always chooses something pink or fancy!